A CEO dashboard lets your CEO or manager track business performance and easily see only the high-level digital marketing and sales data they need. It makes it simple for your CEO to stay on top of everything from gross sales to revenue growth to ad spend and everything in between. There are a ton of key metrics you could include in a digital marketing or sales report for your CEO or GM - but (s)he is probably only interested in the most relevant key performance indicators. Show him/her only the stats needed to make informed decisions about the business and marketing campaigns. What is a CEO dashboard? A CEO dashboard is a digital marketing and sales reporting tool tailor-made for CEOs or other executives. It lets the executive team see the high-level metrics they're interested in, and lets them easily track the company's performance in sales and marketing in real time. It also gives your CEO a good overview of your business and how your products are selling. Why use a CEO dashboard? Reporting on sales and marketing efforts is essential for management. A CEO dashboard is a powerful tool that helps inform management's decision making and allows informed decisions to be made about where marketing and sales campaigns should be focused. It also lets you display the value of all your hard work! What are the benefits of using a CEO dashboard? Besides enabling you to combine all your marketing analytics into a single platform, your CEO dashboard also helps you: show your boss what you do and why it's important, showcase your positive results in a simple and effective way, and keep management in the loop about your sales and marketing efforts. Create your own CEO dashboard today! What are the best CEO dashboard KPIs? From sales numbers to ad spend to ROI, there are a stack of different key performance indicators you can include in your CEO dashboard. However, an effective CEO dashboard will include only those business metrics that management is interested in and not overwhelm them with too much detail. Revenue tells you how much money has been made from sales of products or services. 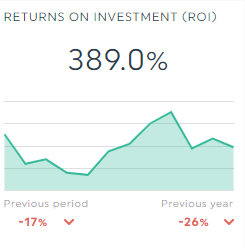 Return on Investment tells you whether your marketing campaigns have been profitable. 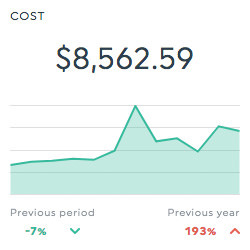 Total cost tells you how much money has been spent on digital marketing or advertising. Total transactions tells you how many times your product or service has been purchased. What are the top CEO dashboard metrics? Don't get focused on "vanity metrics" (data points that seem pretty but don't really offer any actionable insight). Instead, focus on those business data metrics that your CEO and the marketing team can act on. This metric tells you the total number of times your website has been visited over a set period of time - whatever the user does during that time is counted as one session. This metric tells you the number of times a goal has been completed by visitors to your website (a goal could be a purchase, signing up to a service, etc). This metric tells you the average Google AdWords cost per transaction on your website - it divides the total AdWords spend by the number of transactions. What platforms should a CEO dashboard include? A good CEO dashboard should include all the platforms you're using for digital marketing. You and your management team will be able to compare and combine data from these different platforms within the dashboard so everyone will gain further insights into how your channels play off each other, drive sales, and increase company growth. DashThis' CEO dashboard sample gets your sales and marketing team off to a running start. It includes preset KPIs, multiple available data sources, and easy-to-use features. Plug in your own data from across different marketing platforms for easy data visualization. Displaying your marketing analytics is as easy as 1-2-3! Whether you choose from among our preselected CEO dashboard templates, or create your own from scratch; it's all a matter of dragging-and-dropping the KPIs you want! 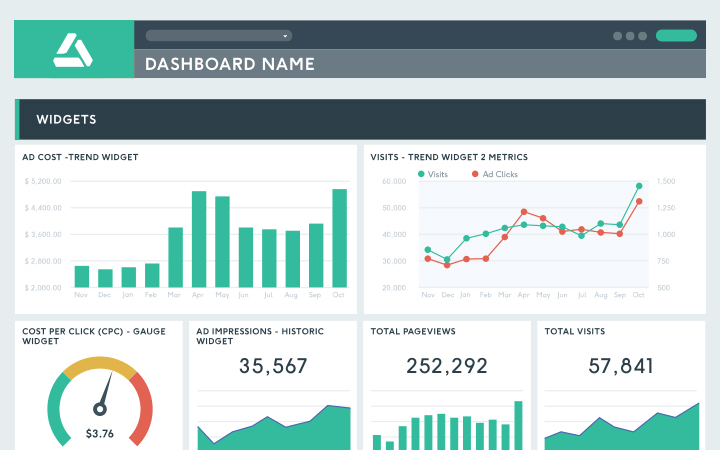 It's your data, do what you want with it - customize your dashboard to reflect your branding! Get reports done on time, so you can spend more time closing potential customers, with our monthly sales report dashboard. You can also choose another time period, such as weekly or yearly. Bring all your marketing channels together in one convenient dashboard. 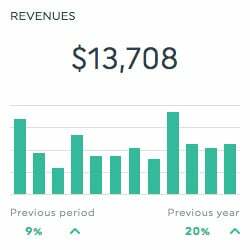 Easily track and report on everything from social media to paid ads to SEO. Exploiting social media traffic and properly tracking social media campaigns is critical to any digital marketing effort. Our social media dashboard makes it easy. Digital marketing without measuring, reporting, and analyzing is like flying blind! Get tricks of the trade from our team to create the best CEO dashboards that your team and your clients can use regularly to create better campaigns and marketing strategies!